The New York Times bestselling sensation A scientifically rigorous, fully illustrated guide to animal flatulence that will delight readers of all ages. Dogs do it. Millipedes do it. Dinosaurs did it. You do it. I do it. Octopuses don't (and nor do octopi). Spiders might do it: more research is needed. Birds don't do it, but they could if they wanted to. Herrings do it to communicate with each other. In 2017 zoologist Dani Rabaiotti's teenage brother asked her a most teenaged question: Do snakes fart? Stumped, Rabaiotti turned to Twitter. The internet did not disappoint. Her innocent question spawned the hashtag #doesitfart and it spread like a noxious gas. Dozens of noted experts began weighing in on which animals do and don't fart, and if they do, how much, how often, what it's made of, what it smells like, and why. Clearly, the public demands more information on animal farts. Does it Fart? 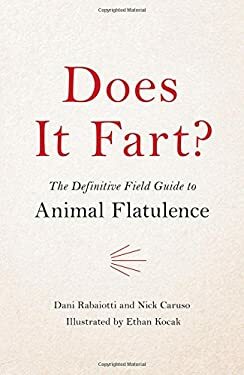 fills that void: a fully authoritative, fully illustrated guide to animal flatulence, covering the habits of 80 animals in more detail than you ever knew you needed. What do hyena farts smell especially bad? What is a fossa, and does it fart? Why do clams vomit but not fart? And what is a fart, really? Pairing hilarious illustrations with surprisingly detailed scientific explanations, Does it Fart ? will allow you to shift the blame onto all kinds of unlikely animals for years to come.